After walking for hours around the city and exploring every nook and cranny, wouldn’t you like to relax and just calm your mind for a while? After all that culture hunting and history, it’s probably time for some entertainment and what’s better than a movie? But don’t you hate it when you’re at the movies and there’s a little kid right behind you, bawling away? Or when you’re queuing up to get a ticket and standing in the line is more fraught with peril than the movie you’re about to watch? What you really need is some relaxation but guess what? Movie lovers, there is hope! The Cambridge Arts Picturehouse promises to give you a fabulous movie watching experience, noise free, hassle free and what’s more, you can take a glass of wine into the viewing room too! In 1937, the Regal Cinema opened up on this very spot, but was closed down in 1997. Two years later, the complex was taken over by Wetherspoons, with the largest pub in all of England inhabiting the ground floor. The three-screened Arts Picture House occupies the remaining space. From the outside, this classy cinema hall stands out in its green and ochre colours, its nameplates framing that of its in-house restaurant. As you step in, luxurious mauve paint blends in with tasteful designs and the spaciousness of the restaurant catches your eye. The menu is quite tasteful and they serve up alcoholic beverages as well. The movies that play are mostly serious drama or art house movies, with work by the likes of Richard Linklater up for viewing. There’s also a brilliant collection of operas and ballets, as well as plays from the National. You can read movie and play reviews online, check out the latest listings and even book tickets, all from the convenience of your own home. Also, visit the popular attractions in the city by following Cambridge itinerary 1 day. All areas of the building are accessible to customers with limited mobility, including wheelchair users. Seats can be folded in each of the auditoria to accommodate wheelchairs. It is recommended that you telephone to confirm availability and to book a space to avoid disappointment when you arrive. Guide dogs are welcome at the Arts Picturehouse. If you wish to take a dog into a performance, please let us know when booking so we can arrange an aisle seat. Alternatively, your dog can be cared for by a member of staff for the duration of the performance. Their staff will provide drinking waterfor your dog. Certain performances carry subtitles and these are clearly indicated in the programme. There is a fully accessible separate toilet on the same level as the Box office. There is an emergence call-point inside should you need to summon assistance. Our telephone lines are open from 9:30am - 8:30pm, seven days a week. Please call 08719025720. By Rail: The theatre is a short 20 minute walk from the railway station. From the station, walk until you come to the end of Hills Road. Walk past Regent Street and St. Andrew’s street until you see an enormous pub called the ‘Regal’. By Bus: Local buses stop on the Drummer Street bus depot, a 2 minute walk from the cinema. By Car: See the City Centre car park map. 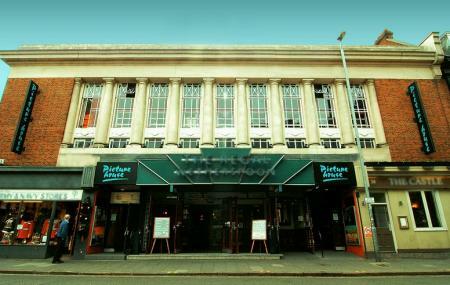 How popular is Arts Picturehouse? People normally club together Cambridge Corn Exchange and Kettle's Yard House & Gallery while planning their visit to Arts Picturehouse. Cozy bar and coffee area with a friendly atmosphere and staff to hang out before you see a movie (or just to chill after work. Does good lite bites like chips too and for a good price. Seats in theatre are comfortable and reasonably spaced. Sound quality and maintenance of the screens are always good. Selection of movies usually more varied than the other cinemas in Cambridge but still shows some mainstream Hollywood movies. Has a great film festival in autumn but usually has mini collections on at all times. Best cinema ever, great choice of films including those that you won't find in the big multiplexes, great cafe and bar with snacks and lunch if you have some time to kill before your showing! I will never forget watching the whole of Nymphomaniac in one sitting here, great times! Great cinema in the centre of Cambridge. Selection of a more 'artistic' movies with many choices of Q&A sessions after some viewings. However, films are usually around 6pm or 8pm, so some films at 7pm (after dinner with reasonable time to go to bed) would be a welcome change. Nice bar. Lovely cinema but for the second time in a fortnight, the restaurant was closed. Apparently, it's going to be closed next Wednesday as well due to staff shortages. I hope this is sorted soon as it's a good place to eat. Great cinema with lots of screens, great seats, great leg room and fantastic sound/picture/view. However the downside is that the older cinema screen numbers have been rubbed off so it's a struggle to find what seat is yours.